Bush wants to give people more choices, but his plan is missing some major details. He would eliminate all mandates from the current law. That means businesses wouldn’t have to cover employees. And insurance companies could reject coverage for people who are already sick. Bush did not say how many people would be left uninsured under his plan. Bush said he expects insurers to cover those people, but doesn’t say how. "We will expect that vulnerable Americans, regardless of how much money they make, get the care and outcomes they deserve," Bush said. Bush would encourage people to buy health insurance by offering tax credits. And everyone would receive the same tax credit. 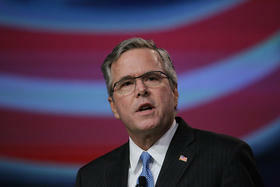 Bush said his healthcare system would mean patients could understand prices easier. Patients would be allowed to save more -- tax free -- to spend on healthcare bills. And doctors and hospitals would find ways to make care less expensive. "Innovation led by the private sector will be at the center of everything we do," he said, "because that's the only way can get better care at lower costs." He also said repealing Obamacare would make it easier for employers to add jobs without worrying about penalties or additional costs for health insurance.